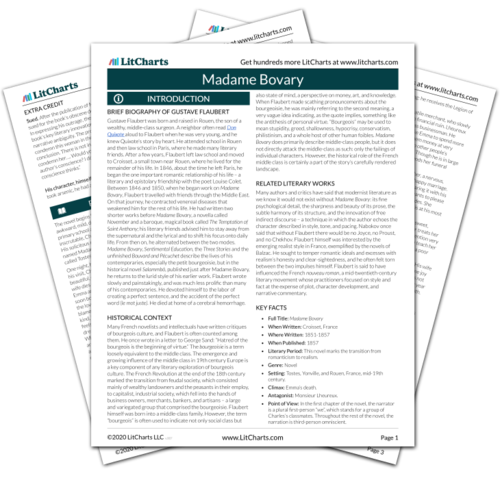 Instant downloads of all 942 LitChart PDFs (including Madame Bovary). 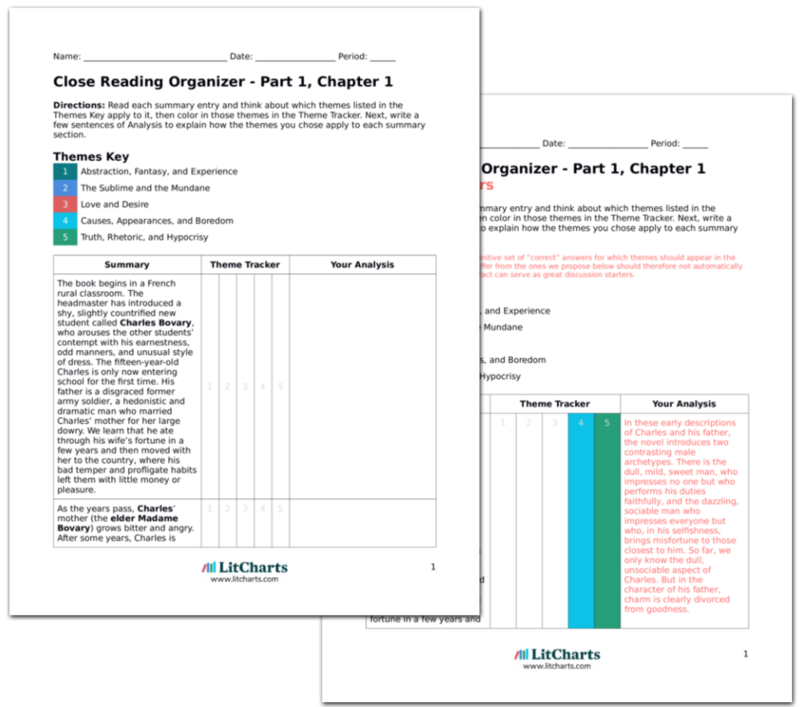 LitCharts assigns a color and icon to each theme in Madame Bovary, which you can use to track the themes throughout the work. At home, Rodolphe looks for some memento of Emma. He keeps a tin full of old love-letters and miniatures, and as he looks through it all his lovers seem to blur together and finally seem like “a load of nonsense.” He writes Emma a false and cloying letter explaining that he must cancel their plans; he loves her too much to let her ruin herself. He adds that he is leaving Yonville the following day. He even adds a fake teardrop. To Rodolphe, all his old lovers really are an indistinguishable mass of photographs, of empty, interchangeable images. The photos bolster his faith in the nonexistence of actual feeling. This faith makes it easier for him to lie to Emma with an easy conscience: you can’t betray something that does not exist. The next morning, his servant delivers the letter to Emma in a basket of apricots. When she reads the letter, she is angry and delirious, and nearly throws herself out a window. Over dinner, Charles himself mentions Rodolphe’s departure, which is all over town. Just then, Emma sees Rodolphe’s carriage pass through the square and faints straightaway. She remains feverish and delirious for over a month. Charles tends to her carefully, but any reminder of Rodolphe throws her into near-insanity. Emma’s insanity is a dark, mysterious rupture in her constructed reality. Rodolphe was the right kind of man, and he said the right kinds of words: on the surface level, he was perfect. To comprehend his betrayal, Emma would have to perceive a reality beyond that surface reality. She is not capable of it. Her insanity allows her to erase the past instead of understanding it. Tsykynovska, Helen. "Madame Bovary Part 2, Chapter 13." LitCharts. LitCharts LLC, 24 Jul 2014. Web. 22 Apr 2019. Tsykynovska, Helen. "Madame Bovary Part 2, Chapter 13." LitCharts LLC, July 24, 2014. Retrieved April 22, 2019. https://www.litcharts.com/lit/madame-bovary/part-2-chapter-13.